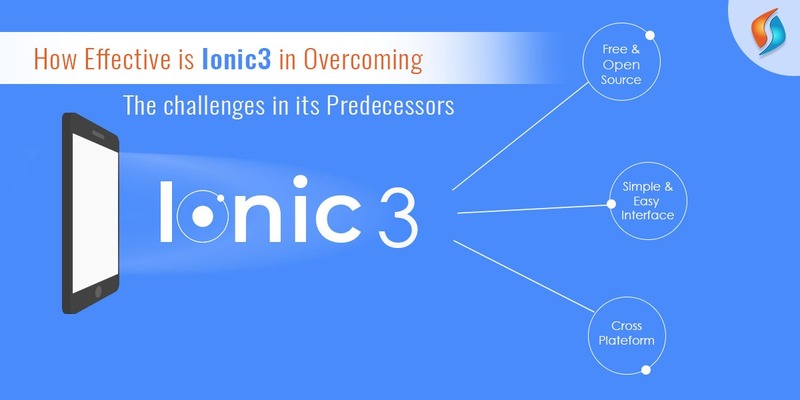 ﻿ How Effective is Ionic 3 in Overcoming the Challenges in its Predecessors? How Effective is Ionic 3 in Overcoming the Challenges in its Predecessors? Do you have the confusion as to which framework to choose for the mobile app development services? Are you still unsure? Why not consider Ionic platform to create your cross-operating system (Android, iOS, and Windows) app from a single framework. Now you may ask, is it worth a try? Well, indeed it is! Who knows you may make it your choicest mobile app development platform once you give it a try. It has got all those features that you would find interesting. What are those features? Let us say a word or few about them. The user interface of apps developed with Ionic has this advantage of receiving an automatic native look so that it never looks out of place. For the Android platform, it will automatically take shape peculiar to Android-based apps. And the same is the case with iOS and Windows as well. That gives these apps great flexibility. We insert all those features that are native to the device into the app with the help of its Cordova. It gives your app access to device`s camera and everything else from email to gallery. Along the way, as you develop the mobile app development solutions with Ionic, you also come to learn much Angular, which is undoubtedly considered a best developing framework for web applications. To get the firsthand look at how your app might look on various devices running on different operating systems, Ionic Lab will ease it out for you. It will offer you a live preview of your app showing you how it will look on Android-iOS-Windows devices. You will get an update automatically on any changes you make to it. There are many other features as well. But these are enough to give an idea of how dynamic and all-encompassing Ionic as a framework for mobile app development is. What we have now at hand is Ionic 3, which, as the word goes, has been instrumental in overcoming various challenges in its predecessors. Why upgrade from Ionic 2.0.0 to Ionic 3.0? To continue with the Ionic 2.0.0 had its own set of challenges. A major one of them was Angular, which got an upgrade to version 4.0.0. This made an upgrade of the Ionic framework necessary to make it compatible with the upgraded version 4.0.0 of Angular. On similar grounds, it (Ionic 3) comes with a compatibility factor for supporting upgraded versions of TypeScript 2.1 and 2.2 respectively. All those challenges its predecessors were facing in enterprise mobility solutions have been dealt with as Ionic allows you much-improved build up time and running in your application a thorough type checking. In this version of Ionic, you`ll see for the first time that it will support the feature of lazy loading. The intention is to make your application work faster or to accelerate its speed. The central focus of upgrading Ionic 2.0.0 to Ionic 3.0 is there on improving the performance of your application. To make it desktop friendly and removing bugs and other errors. Millions of app, in different domain from business to social-centric apps, were created with the help of the Ionic framework, and they`re doing well. It has not only reduced the cost significantly but also made the whole process of mobile app development relatively very fast, reducing time consumption. So the necessary thing to remember in mobile app development services about Ionic 3 is that it is not an entirely different framework altogether but an updated version which would have many improvements going on in the background that would bring efficiency regarding speed, interface, and provision for lazy loading a module. It also the very grid of the Ionic framework that has received changes. And now, instead of relying entirely on width and columns, you will be using columns only. Similarly, you`re going to witness a few modifications in typography itself. Like the use of Angular 4.0.0, which is a force to reckon with for a developer community. It will bring new and innovative features to Ionic 3 that will show up in the web applications you create with it as your framework. Look, many people out there have different things to say about the updated version of Ionic 3. But keeping that aside, it is better to know what the motive of a developer today is, what does he expect from the framework he is using to develop an app? A developer in present time would desire to create apps that extremely intuitive and free from lags and bugs. Because they want the process to be speedy, they want desktop compatibility. Well in the light of these expectations, the Ionic 3 is your go-for framework without the least doubt and Signity Solutions, the right partner, is the best mobility service provider in India. Earlier whenever we used to write codes for various plugins, the code size used to get bulky. But now we have got the solution in terms of Ionic 3 platform. As Ionic 3 comes with a feature where you can opt for any plugin of your choice without including it in your code bundle. With this, we got a reduction in the size. While at the same time revamping the whole structure of your application and making it dynamic. Another significant feature is the possibility of modifying the pattern of any given page you desire. This is done by configuring further with the help of the tool called lazy loading. You can decorate any page according to your choices and in relatively lesser time without investing much effort. With that said, we now reach the same question we began our article with. How effective is Ionic 3 in overcoming the challenges in its predecessors? But the difference now is that now you`re fully qualified to answer it yourself. Join hands with the best mobile app development company in India! With our IT outsourcing services, you leap into the new potential markets to reap its untapped benefits and strengthen your market presence globally. So join hands with Signity Solutions and see your business soar to new heights with our mobile app development solutions.